In what may have been the tightest race so far for the VAT Wonder Goal award, Abia Warriors midfielder Shedrack Asiegbu fought off stiff challenges from NPFL top scorer, Stephen Odey of MFM and Musa Newman of Akwa United to emerge winner of the Matchday 25 edition. Goals scored by the three were shortlisted out of the total 18 goals of the matchday and at the end of voting, a total of 731 fans voted on the website while another 361 voted on the Twitter platform. Asiegbu’s goal was the favourite for 335 voters on the website and was followed by Newman who polled 209 with Odey getting the nod from 187. However, of the Twitter voters, Odey ran far ahead with 184 of the 361 while Asiegbu had 90 and Newman picked 87 of the total votes. Asiegbu thus polled a cumulative 425 votes to edge Odey on 371 with Newman receiving the least combined votes of 296. 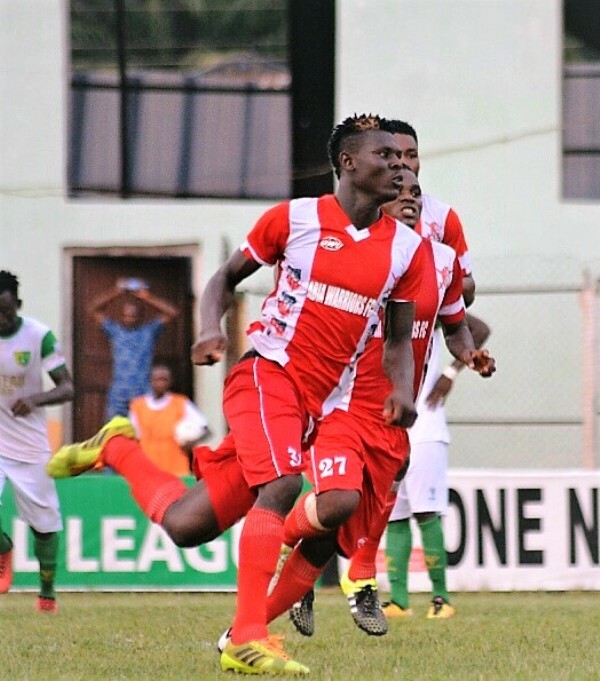 The Abia Warriors midfielder had netted twice in the fixture against league leaders, Plateau United at the Umuahia Township Stadium but it was the first of his two goals that caught attention. It was a perfect ending to a move that began with a throw-in on the right channel of Abia Warriors' attack when Yakub Hammed threw the ball to Sunday Adetunji who shielded it nicely at the edge of Plateau United's box before cushioning it to Uche Ihuarulam whose intended cross took a deflection off the back of Plateau United's Jimmy Ambrose. The ball then fell kindly to Asiegbu who controlled with his chest towards his left foot and struck sweetly into the top corner beyond Plateau United goalkeeper Dele Ajiboye for the first of his two goals on the day. Asiegbu becomes the 6th Wonder Goal winner joining the rest that includes Ayo Saka (Rivers United), Ubong Friday (Akwa United), Salefu Ochowechi (Remo Stars), Pascal Seka (FC Ifeanyiubah) and Ahmed Usman of Wikki Tourists. The award carries a reward of N150,000, half of which will be donated to a charity to be nominated by the player from within the state where the club is based. The VAT Wonder Goal is an initiative of the League Management Company (LMC) and supported by the Federal Inland Revenue Services (FIRS) as a social investment to drive tax education and deepen clubs and community engagement.